We caught up with Paul Smith at the European launch of the Silver Sky to find out more about a project that has been two years in the making and all-consuming for those involved. The result of so much perspiration is a guitar that even Smith himself struggles to stop playing. 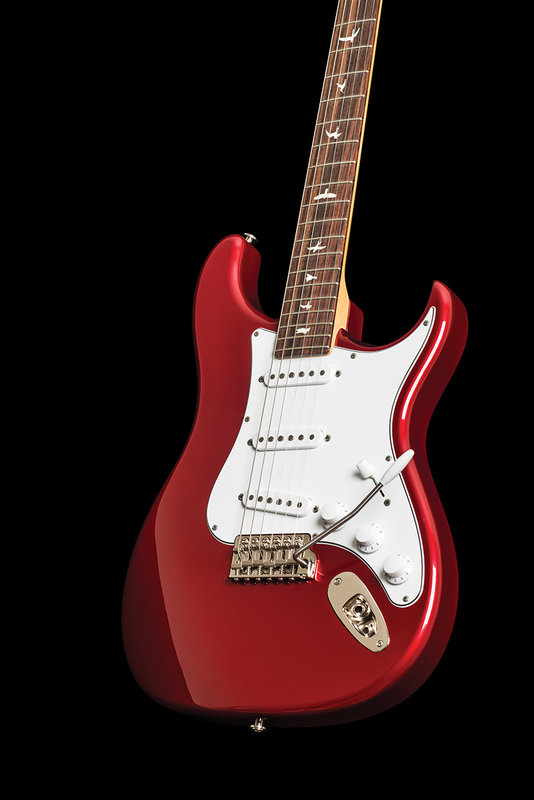 A big part of the appeal is undoubtedly down to the instrument’s supremely comfortable, vintage-style neck. The Silver Sky’s 7.25-inch ‘board radius has been the source of a great deal of debate among online commentators. We’re curious to hear Smith’s response to those dissenting voices. “When I listen to Machine Gun I don’t hear any problem with Hendrix playing solos,” Paul notes. “When Stevie Ray Vaughan was playing I don’t hear any trouble. When John Mayer is playing Gravity I don’t hear any trouble. You’ve gotta be kidding me! Does that mean that levelling the Silver Sky’s frets takes longer than it would on a PRS with a flatter radius? “Yes and no,” says Smith. “I spent more time training the fret leveller ’cause there’s less fretwire. The natural inclination is to level them all the same, but you can’t do that. You have to train somebody to work three times harder on one side than the other. When it came to the voicing the 635JM pickups, although sounding like a “really good” pre-CBS Strat was part of the plan, it wasn’t a simple matter of replication. “The definition of insanity is doing the same thing over and over again and expecting a different result,” says Paul. “You can’t just wind ’em up the way the internet tells you to wind ’em up and think they are going to sound like that, that’s not the way it works. We had to figure out what was going on and it’s not simple. We have a machine that tells us what a pickup sounds like before we ever plug it in. I had the screens right, and they looked like the old ones, finally, and I plugged it in. When I heard it I went, ‘Well, there it is’. I wasn’t guessing any more. “On the old guitars it was a crapshoot. This is not a crapshoot. Now we have computerised winders and the engineering has been done so it sounds good. I made [the polepieces] staggered but not the way it would be for a wound G – I changed the staggering for modern strings and it didn’t hurt anything. It has a plastic bobbin not fibreboard. When we were struggling with the pickups I suspected maybe it was the plastic bobbin but it ended up not being that at all. The process also included other refinements that aimed to make the experience of playing a vintage-style bolt-on somewhat less of a white-knuckle ride. “The arm’s higher so it doesn’t hit the knob,” Paul explains.